A plant known by a wide range of names referencing its bright golden root, goldenseal has found use as a general health remedy for hundreds of years. In Native American cultures, goldenseal was administered to help heal wounds, act as an anti-inflammatory agent and ward off cold and flu symptoms. It also can act beneficially as a general health tonic, said to increase the body’s energy levels and lessen any general malaise. In the 1700’s, there was huge demand for this powerful new herb after European colonists brought it back over from the New World. Today, it is still used in cold remedies and a number of different nutritional supplements, as it has been proven that its health benefits have definite lasting power. Due to high demand, this plant was put on the endangered list in the 1990’s and has only just started to spread again with careful harvesting practices. The antiviral and antibacterial properties to be found in drinking goldenseal tea make it highly effective for treating infections and cleansing the body of any sicknesses or disease it may be fighting off. It can also aid the body by providing a boost the immune system, which may prevent future illnesses as well. For common colds and influenza, this boost in the immune system may prove to be quite useful. Since this tea also works as an anti-inflammatory, it can help relieve any swelling in the nose and mouth as well, symptoms often associated with cold and flu infections. Goldenseal tea’s many antibacterial and antiseptic properties can help fight off and kill bacteria, helping to improve digestion as well. The tea works to bring relief to those that suffer from symptoms like upset stomach, cramps, diarrhea, as well as a variety of other gastrointestinal problems. Other benefits include the stimulation of appetite, resulting in obtaining more nutrients to your body to help you fight off a number of sicknesses. Another prominent benefit to drinking this tea is that it helps keep many of the body’s organs healthy and properly functioning. Some of the organs goldenseal tea positively affects are the spleen, liver, and pancreas. This comes directly from its ability to increase blood circulation in these areas, which stimulates the organs to function at their optimum performance. Preparation: To prepare goldenseal tea, take one tea bag and allow it to steep in a cup of hot water for a period of 5 to 7 minutes. As this brew can be somewhat bitter, sugar, honey, or milk can be added if desired for improved flavor and taste. 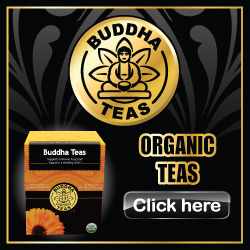 When searching for the best cup of goldenseal tea, look first to Buddha Teas. A tea company that places emphasis on quality ingredients without any chemical adulteration, Buddha Teas stands above its peers by offering you tea held to the highest standard. Buddha Teas has over a hundred different varieties of tea, making it the best place for any tea connoisseur to indulge in their favorite brew while also expanding their horizons. Since goldenseal tea can be quite strong, it’s recommended to speak to a healthcare professional before you use it specifically for detoxifying your body. As with any diet or detox program, there may be some risks associated with prolonged use. Those with heart conditions are also advised to speak to a doctor first, as some studies have shown that goldenseal can raise blood pressure. With supervision, this can be a potent and effective remedy for clearing out the system and improving one’s overall state of health. We hope that this article can answer any questions you may have, though if you do have any further inquiries please feel free to contact us.